When will the Superman grille fully consume the Acura lineup? 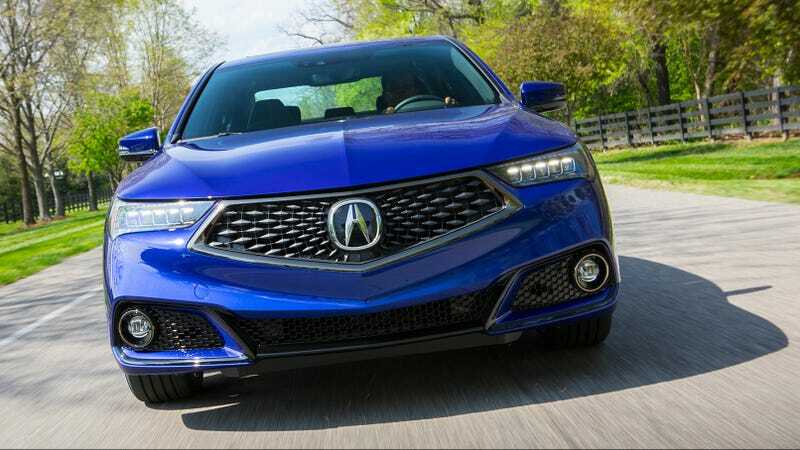 Hey everyone, let’s ponder the not-so-exciting Acura lineup and its equally not-very-interesting attempts at front end styling themes that nonetheless manage to irritate large swaths of the internet that otherwise don’t really care about Acura cars! So far, Acura’s new Superman grille has replaced the beak grille on the TLX and MDX. These are Acura’s newest vehicles outside of the NSX, so it makes sense that they were Supermanified during their mid-cycle refreshes. But what about the rest of the Acura lineup? Seriously, why the hell is Acura still selling a tarted-up previous-generation Civic? This makes absolutely zero sense to me. Even with the assorted more-premium bits that come along with the Acura transformation, the previous-generation Civic is a vastly inferior car to the current Civic. If someone wants a luxurious Civic they should buy a current-generation Civic Touring, not an ILX. The Civic Touring tops out at $27,475 including destination. The TLX starts at $33,950 and has less equipment than the Civic Touring. Maybe that leaves room for an ILX to exist, maybe not. The RDX is Acura’s second best-selling car behind the MDX and shares its platform with the Honda CR-V. The current RDX has been around since the 2013 model year, whereas the CR-V on which it is based was updated for 2012. Since the CR-V was just updated for 2017, you might expect a new RDX based on the new CR-V would show up for 2018, but you would be wrong. The 2018 RDX configurator is live on the Acura website and it’s the same car. Maybe it’ll be updated for 2019. I’d expect it to get the 2.0 turbo from the upcoming Accord, and maybe continue to have a V6 option. I actually rather like the RLX. Wait, wait, I hear you laughing, wait, I have a reason! The only problem with the RLX is that the Accord is already bigger than the TLX. The RLX is only a little bit bigger than the Accord. There’s not that much more room or really much of anything to distinguish the base model RLX from a loaded up Accord V6. But the RLX Sport Hybrid is actually rather cool. I still think Acura should’ve left the TL (and TLX) to do the volume selling and only sold the RLX Sport Hybrid. That’s exactly what Honda does in Japan where the RLX is sold as the Honda Legend. Unfortunately, the base fwd non-hybrid RLX led everyone to perhaps rightfully criticize the RLX as a slightly nicer/bigger Accord for a lot more money. The RLX has yet to receive a mid-cycle refresh since being introduced for the 2014 model year. So you know what that means! We all know how long the original NSX stuck around with basically only a couple of mild refreshes. The new NSX just came out and the beak is fully integrated into the overall front fascia. I’m not sure how exactly the Superman grille could be integrated into the styling. But I wouldn’t put it past Acura to do it as part of a future update. The CDX is an Acura-fied Honda HR-V but with the 1.5 turbo out of the Civic and CR-V, that’s exclusively sold in China. Acura supposedly might bring it to the US, probably. They should, what with the subcompact crossover segment blowing up in popularity. They’d sell a whole lot more of them than the stupid ILX. And well, it’s already got the Superman grille.